Marvel released the first details for Agents of S.H.I.E.L.D. 's midseason premiere, "Epidemic", which reveals that Adrianne Palicki has been promoted to series regular status. ABC has yet to announce if the show will return for Season 3 yet, but if a renewal is issued, fans will get to see much more of Adrianne Palicki's Bobbi Morse, a.k.a. Mockingbird, in the near future. Take a look at the official details for "Epidemic" below. After discovering an alien city with ties to his resurrection, Coulson (Clark Gregg) and his team destroyed it before the forces of Hydra could claim its secrets, eliminating the villainous Whitehall (Reed Diamond) in the process. But new threats to the world have arisen, including Skye's father, Cal (Kyle MacLachlan), who now seeks retribution against Coulson for stealing his revenge against Whitehall; a disturbing alliance between former S.H.I.E.L.D. agent Ward (Brett Dalton) and Agent 33; the enigmatic Raina (Ruth Negga), who struggles with her transformation into something inhuman by the alien Obelisk and seeks vengeance; and Skye (Chloe Bennet), who developed mysterious new powers from the Obelisk but whose lack of experience with her new abilities may threaten the safety of those she loves. Meanwhile, Bobbi (Adrianne Palicki) and Mack (Henry Simmons) begin the next phase of a plan which seems to have grave repercussions for Coulson and his team, who are unaware that there's another mysterious force moving against them. And as Hunter (Nick Blood) is forced to make the biggest choice of his life, Coulson will find his mission threatened by this shocking endgame. In the midseason premiere, "Epidemic", Coulson's team must deal with the consequences of their war with Hydra as shocking revelations threaten to tear them apart, and Hydra makes a dangerous move that may involve a traitor in S.H.I.E.L.D. 's midst. Agents of S.H.I.E.L.D. stars Clark Gregg as Director Phil Coulson, Ming-Na Wen as Agent Melinda May, Brett Dalton as Grant Ward, Chloe Bennet as Agent Skye, Iain De Caestecker as Agent Leo Fitz, Elizabeth Henstridge as Agent Jemma Simmons, Nick Blood as Lance Hunter and Adrianne Palicki as Bobbi Morse. 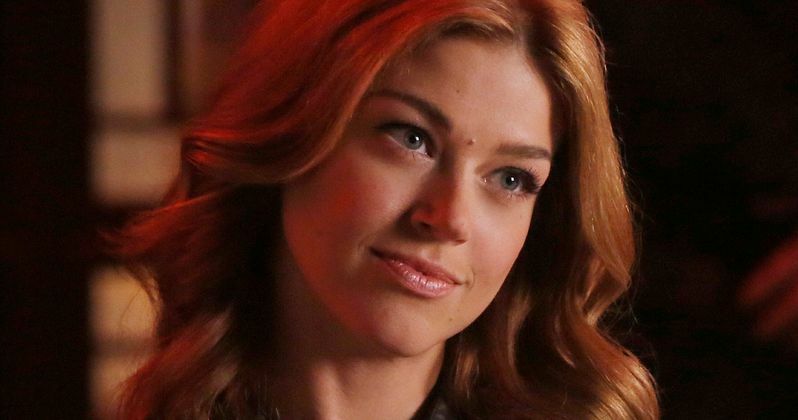 Are you excited to see more of Adrianne Palicki's Mockingbird when the show comes back? Let us know what you think, and stay tuned for more on the second half of Marvel's Agents of S.H.I.E.L.D. Season 2.